Since 1986, Hardware Express has provided superior service, quality construction products and custom hardware to builders, homeowners and the art community on the West Side of Los Angeles. 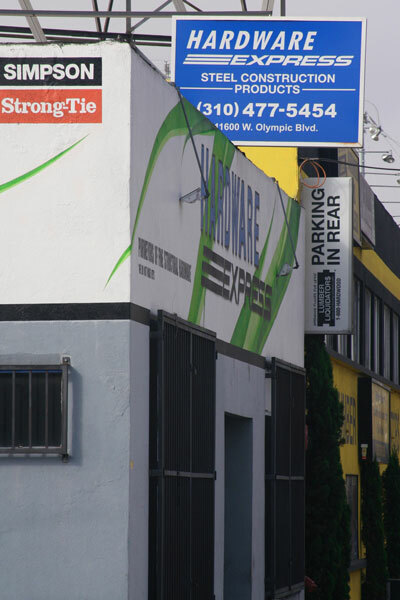 Hardware Express was founded in 1986 when Michael Dituri bought the shop from an old time Santa Monica local, the late, great, hardware genius, Paul Sherman. Paul stayed on working part time for a couple of years, training the new workforce. When Paul finally stepped away from the business, he knew his business philosophy of personalized service and meticulous attention to detail had been firmly ingrained in the day-to-day operation of the shop. In ’02 Dave Cox, long-time employee, bought the company from Michael Dituri. Though it was clear that we had outgrown our old location in Santa Monica in the ‘90s, just the thought of moving all this stuff seemed overwhelming. We only began looking for a new location around 2005. After a three year search, we settled into our new shop on Olympic Boulevard in West Los Angeles. Over the years, we have streamlined the shop’s operation. In addition to expanding our line of products to include the latest hardware from Simpson Strong Tie, GripRite and Hardy Frames, we know how to acquire hard-to-find items quickly and efficiently. Part of the secret to providing excellent service is knowing how to ask the right questions. In addition to supplying high quality framing and foundation steel construction products for projects on the West Side, we have cultivated good relationships with artists in the area who have come to appreciate our unique services. Whether you are constructing a custom home or just need a few nails or bolts for your kid’s school project, we are here to help. By the way, we don’t make keys… Yet!